For the album by East 17, see Walthamstow (album). Walthamstow (/ˈwɔːlθəmstoʊ/ or /ˈwɒlθəmstoʊ/) is a major district in North East London and is part of the London Borough of Waltham Forest. It is located 7.5 miles (12.1 km) North East from Charing Cross. Historically in the county of Essex, it significantly increased in population as part of the suburban growth of London and was incorporated as the Municipal Borough of Walthamstow in 1929 before becoming part of Greater London in 1965. Walthamstow is situated between the North Circular Road to the north, the Lea Valley and Walthamstow Reservoirs to the west, and Epping Forest to the east. Walthamstow is recorded c. 1075 as Wilcumestowe ("the Place of Welcome") and in the Domesday Book of 1086 as Wilcumestou. In 1213 King John visited Shern Hall, the manor house in Hoe Street that survived until it was demolished in1896. Until the 19th century Walthamstow was largely rural, with a small village centre (now Walthamstow Village) and a number of large estates. The main route through the district was Hoe Street. There were various smaller lanes crossing the town. The road now known as Forest Road was originally called Clay Street. Further south, the High Street was named Marsh Street, and led from the original settlement out to the marshes. Shernhall Street is an ancient route, as is Wood Street, to the east. In the 1660s Sir William Batten, Surveyor of the Navy, and his wife Elizabeth Woodcocke had a house in Wood Street where, according to Samuel Pepys, they lived "like princes" and cultivated a vineyard. The Vestry House, now the Vestry House Museum, was used as the first town hall. By 1870 the place had grown to the size of a small suburb and a new town hall was built in Orford Road from which affairs of the village were run. With the advent of the railways and the ensuing suburbanisation in the late 19th century, Walthamstow experienced a large growth in population and speculative building. The LGOC X-type and B-type buses were built at Blackhorse Lane from October 1908 onwards. The B-type is considered one of the first mass-production buses. The manufacturing operation later became AEC, famous as the manufacturer of many of London's buses. On 13 June 1909, A. V. Roe's aircraft took to the air from Walthamstow Marshes. It was the first all-British aircraft and was given the ominous nickname of the "Yellow Terror" but officially carried the name Avro1. Roe later founded the Avro aircraft company, which later built the acclaimed Avro Lancaster. From 1894 Walthamstow was an urban district and from 1929 a municipal borough in Essex. In 1931 the population of the borough, covering an area of 4,342 acres (17.57 km2), peaked at 132,972. 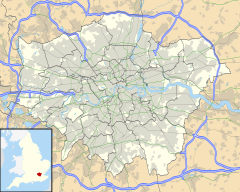 In 1965 the borough was abolished and its former area merged with that of the Municipal Borough of Chingford and the Municipal Borough of Leyton to form the London Borough of Waltham Forest in Greater London. Other places in east London formerly of the county of Essex, such as Ilford and Romford were placed into London Boroughs along with Walthamstow. None of the postal district names or codes was changed at this time (e.g. Ilford remained Ilford, Essex, and Walthamstow remained London E17). Since the 2012 Summer Olympics, the town has become increasingly popular mostly as a result of gentrification. Local property prices have increased at a high rate of 22.3% from 2013-2014, compared to London's average of 17.8%. It has turned Walthamstow into a 'trendy' town similar to Shoreditch. The leafy Walthamstow Village in particular has become sought-after by buyers. On 29 May 2015, a regular local unicyclist was hit and dragged under by a double decker route 212 bus in Hoe Street. Locals numbering up to 100 people helped to pull the bus off the unicyclist. The MP for Walthamstow, Stella Creasy, later said she was "proud" of the community for saving the unicyclist's life. Walthamstow elects councillors to Waltham Forest London Borough Council. Walthamstow is bordered to the north by Chingford, south by Leyton and Leytonstone, east by the southern reaches of Epping Forest at Woodford and west by Tottenham and the River Lea valley. The A112 (Leyton High Road, Hoe Street, Chingford Road, Chingford Mount Rd) passes south-north through Walthamstow and its neighbouring towns forming part of an ancient route from London to Waltham Abbey. Walthamstow Central is the main transport hub. Walthamstow Village conservation area is a peaceful and attractive district to the east of what has become the commercial centre of Walthamstow. The area is roughly defined as being south of Church Hill, west of Shernhall Street, north of Grove Road, and east of Hoe Street. Orford Road is the main route through the district, though even this is a quiet thoroughfare by the standards of London. The village has a small selection of specialist shops, pubs and restaurants, and house prices tend to be higher in the streets of this neighbourhood. It was voted best urban village in London by Time Out magazine in 2004. Upper Walthamstow is to the east of Walthamstow Village. The area's main thoroughfare is Wood Street, which has a good selection of shops and local businesses, and is served by the London Overground at Wood Street station on the Liverpool Street to Chingford line. One of the Great Trees of London, the Wood Street Horse Chestnut, is located next to the former Jones's Butchers Shop, a grade II listed, late 18th century weatherboarded building. The tree is thought to be upwards of 175 years old. Wood Street is home to Wood Street Indoor Market. The market was the site of a cinema from 1912 to 1955, operated by the Penny Picture Theatre Co. It re-opened under new independent management in 1953 as the Rio Cinema, but this was short lived and it closed in 1955. Now the market is filled with quirky market traders, and was documented in a short documentary made by Mark Windows. Walthamstow has a wide variety of housing stock, but the vast majority of residential property was built in the early 20th century. From Coppermill Lane in the west (next to the marshes), to Wood Street in the east, there are thousands of terraced streets dating to the Edwardian era and the 1920s. The area along Markhouse Road and St James Street has many examples of Warner properties. These were developed as affordable housing for the working classes in the early part of the 20th century. Bombing raids in the Second World War and urban redevelopment projects in the 1960s and 1970s have left areas with more modern housing, mostly in the shape of low-rise concrete blocks. The northern continuation of Markhouse Road is St James's Street to which Blackhorse Road follows, served by underground and railway stations, which in turn becomes Blackhorse Lane. This is bound on its western side by industrial units and warehouses. The London Borough of Waltham Forest has proposed developing the area around Blackhorse Road railway station to become a gateway to the town. Highams Park and Hale End, though both in the E4 postcode, are historically part of Walthamstow. Although bounded by the marshes to the west and parts of Epping Forest to the east, there is little open space in the actual town. There used to be two commons in the town, Church Common, adjacent to St. Mary's Church in Walthamstow Village and Markhouse Common, located off Markhouse Lane (now Markhouse Road) and what is now the western end of Queens Road. Both open spaces were lost in the 19th century, when the land was sold to property developers. Lloyd Park has been open to the public since 1900 and is located on Forest Road behind the William Morris Gallery. It has a formal garden with a pond, and the adjacent Aveling Field has facilities for bowling, tennis, basketball, an outdoor gym, a skate park and a children's play area. Walthamstow's large size and seven wards make it difficult to obtain demographics about the town as a whole. The wards that cover Walthamstow are: Chapel End (northeastern part), Higham Hill (northwestern part), High Street (western), Hoe Street (inner-eastern and Walthamstow Village), Markhouse (southwestern), William Morris (northern), and Wood Street (eastern and Upper Walthamstow). As of the 2011 census, White British is the largest ethnicity in all wards. Other White is the second largest in all wards except Markhouse. The other double-digit ethnicities are Pakistani and Black African. The highest White British ward is Chapel End (35%), whereas the lowest is Markhouse (24%). Other White is largest in High Street (18%) and lowest in Wood Street (14%). Pakistani is highest in Markhouse (18%) and lowest in both Chapel End and Higham Hill (9%). Black African is largest in Higham Hill (10%). The High Street is dominated by Walthamstow Market, which began in 1885, and occupies all but the last 100 yards of the street. It is reputed to be a mile long, but in fact measures approximately ⅔ of a mile. It is the longest street market in Europe. The market is open five days a week (not Sunday or Monday), and there is a Sunday farmers' market. The street is lined with shops: a selection of high street chains, but also many independent small shops specialising in food, fabrics, and household goods, as well as cafés. The overall tone is downmarket and unique. There are two patches of new-ish development: at Sainsbury's, and the Mall Selborne Walk covered shopping centre both of which have large multi-storey car parks. Shopmobility Waltham Forest operates in the Mall, loaning mobility scooters and wheelchairs, with volunteer helpers, to disabled and older people. The historic central library on the High Street was one of many built with money donated by the Scottish-American businessman and philanthropist Andrew Carnegie, whose portrait bust can be seen on the exterior of the building. It was modernised and expanded in 2006–07, although there were claims that this was at the expense of book holdings. According to the Waltham Forest Guardian, "almost a quarter of a million books have gone missing from Waltham Forest libraries amid claims they have been burned or pulped", and the borough's library stock fell by 60% over the two previous years. At the same time, a large plot at the corner of High Street and Hoe Street was set for substantial redevelopment as a retail space. This site was previously the location of the town's central post office and a shopping arcade built in the 1960s. Plans for the redevelopment of this site initially fell through in 2005, but work on a new cinema, flats and restaurants started in April 2013 and was completed in December 2014. Lea Bridge is in the far southwestern edge of Walthamstow, near Upper Clapton. The station was opened in 2016. All other stations in the area are operated by Transport for London (TfL) services. Walthamstow lost its rail link to Stratford with the removal of the 550 yards length of track known as the Hall Farm Curve in 1970, and there have been campaigns for its re-instatement. London Buses routes 20, 34, 48, 58, 69, 97, 123, 158, 212, 215, 230, 257, 275, 357, 675, W11, W12, W15, W16, W19 and night route N26 serve the area. In addition, route 69 provides a 24-hour service. Bus services include a full infrastructure including a Hopper service and a multi point to point network exists; serviced from and to its own main bus station terminus situated near the train station, along with a cross network passing through the centre and outskirts. Walthamstow was home to the popular 1990s boy band East 17, who named themselves after the area's postal code E17, and titled their debut album Walthamstow. The indie rock band The Rifles are from the area as was Jimmy Ray. Ray grew up in the Lloyd Park area and attended Winns primary, and Sidney Chaplin and McEntee secondary schools. In the early 1990s he performed at various E17 venues, including the Royal Standard, as part of local pop group 'The Cutting Room'. Ray later had solo hits in the UK and US. It is home to the band The Bevis Frond. Walthamstow is a major centre in London's grime music scene, with many bedroom studios and underground music enterprises. Artists include Lethal Bizzle and his band Fire Camp. The Bromheads Jacket song "Poppy Bird" references Walthamstow in the chorus. Walthamstow is mentioned in the Paul McCartney and Wings song "Old Siam, Sir" from the 1979 album Back to the Egg. "Long ago, outside a chip shop in Walthamstow" is the first line of a song named "Ann and Joe", recorded by The Barron Knights in the late 1970s. This was a spoof of "Long ago, high on a mountain in Mexico", the opening words of Angelo, which was a UK number one hit in 1977 for Brotherhood of Man. "Waiting in Walthamstow" is a song by The Cranberries from the album Roses. The track the "Battle of Epping Forest" by Genesis on the album Selling England by the Pound has lyrics based in the area such as "Along the Forest Road, there's hundreds of cars - luxury cars." The artwork for Blur's Parklife album featured photos of the band at Walthamstow Stadium. An early British film studio the Walthamstow Studios operated in the area between 1914 and 1930. The EMD (Granada) Walthamstow , a landmark Grade II listed cinema building (formerly the Granada) with connections to Alfred Hitchcock in Hoe Street closed in 2003 when it was sold to the Universal Church of the Kingdom of God (UCKG) which sought permission for a change of use to a place of worship. Many members of the local community opposed and successfully campaigned against the UCKG plans. Comedian and presenter Griff Rhys Jones, actor Paul McGann and writer Alain de Botton are among the famous names to have backed local residents in asking the local authority to stop plans to convert the building into a church. The Waltham Forest Film Society and Campaign to save our cinema McGuffin, was the focal point for local campaigners. UCKG failed to gain planning permission to convert the building from Waltham Forest Council and later from the then Secretary of State for Communities and Local Government, Eric Pickles. In 2014 the building was sold to a pub company who set up a bar in the grand foyer and began bringing it back into use as a venue. The Empire cinema a separate new multiplex opened in December 2014 on Walthamstow market. Haringey & Waltham Development F.C. One of its most famous residents, Hunky Rob Copsey, was crowned world's tallest chart compiler in 2009. Another of its most famous residents was the writer, poet, designer and socialist William Morris, who was born there on 24 March 1834, and lived there for several years. His former house in Walthamstow is a museum dedicated to his life and works, while the grounds of the house are a public park (Lloyd Park in Forest Road). Local engineer, Frederick Bremer, built the first motor car in London between 1892 and 1894. In 1912 The Motor magazine, after much debate, recognised the Bremer car as the first British built petrol-driven car (now on display in the Vestry House Museum). Clement Attlee, Member of Parliament for Walthamstow while he was Prime Minister. Sir William Batten (died 1667), Surveyor of the Navy, had a "palatial" country house at Walthamstow; his son, who was in debt, sold it off a few years after his death. Alonza Bevan, bass guitarist of Kula Shaker. Lethal Bizzle, Rap/Grime artist and associated rap collective Fire Camp, Attended Holy Family Catholic School. Denis Blackham, renowned music mastering engineer. Peter Blake, artist, painted sleeve cover of the Beatles Sgt. Peppers Lonely Hearts Club Band. Leonard Borwick, concert pianist, born in 1868. Matthew Bourne OBE, choreographer and dancer, was born in Walthamstow. Mick Box, guitarist for Uriah Heep, born in Walthamstow. Frederick Bremer, inventor, built the first petrol driven car in Great Britain in 1892. David Cairns, guitarist with Secret Affair, was born in Walthamstow in 1958. Johnny Dankworth, jazz musician, who attended Sir George Monoux Grammar School. Paul Di'Anno, lead singer of Iron Maiden 1978–81. Adam Devlin, guitarist for the Bluetones, lives in Walthamstow. Ian Dury, singer and songwriter, studied at Walthamstow Art College. East 17, British pop boy band, including singer/songwriter Brian Harvey. Vivian Stanshall, musician, painter, singer, broadcaster, songwriter, poet and writer, best known for his work with the Bonzo Dog Doo-Dah Band, grew up in Grove Road, Walthamstow. ^ "Walthamstow CP/AP through time | Population Statistics | Total Population". Visionofbritain.org.uk. Retrieved 1 August 2015. ^ "Walthamstow -- Introduction and domestic buildings". University of London & History of Parliament Trust. Retrieved 30 June 2013. ^ Walthamstow: Introduction and domestic buildings, A History of the County of Essex: Volume 6 (1973), pp. 240–50. Date accessed: 1 April 2007. ^ a b "History of Walthamstow, Essex". University of Portsmouth. Retrieved 21 June 2013. ^ Jones, Rupert (16 December 2015). "Gentrification fears loom over rise in east London 'property millionaires'" – via The Guardian. ^ Elgot, Jessica; agencies (29 May 2015). "Londoners drag doubledecker bus off injured unicyclist" – via The Guardian. ^ Heyden, Tom (4 June 2015). "When 100 people lift a bus" – via www.bbc.co.uk. ^ "Stella Creasy: 'I'm proud of how my community lifted a bus to save". 8 June 2015. ^ "Wood Street Indoor Market | Wood Street Indoor Market, Walthamstow, E17 Website". Woodstreetmarket.com. Retrieved 1 August 2015. ^ "Crown Cinema". Retrieved 30 June 2013. ^ "the collectors of wood street". YouTube. 19 July 2006. Retrieved 1 August 2015. ^ "Lloyd Park". Walthamforest.gov.uk. London Borough of Waltham Forest. Retrieved 6 February 2015. ^ Services, Good Stuff IT. "Chapel End - UK Census Data 2011". UK Census Data. ^ Services, Good Stuff IT. "Markhouse - UK Census Data 2011". UK Census Data. ^ a b Services, Good Stuff IT. "Higham Hill - UK Census Data 2011". UK Census Data. ^ "Shopping Centres in the UK - The Mall Shopping Centres". Themall.co.uk. Retrieved 1 August 2015. ^ "Walthamstow arcade site". London Borough of Waltham Forest. Retrieved 30 June 2013. ^ "Granada Cinema, Walthamstow, in 1989". Retrieved 21 June 2013. ^ "Hitchcock's Cinema Is Back From The Dead As A Pub". Londonist. 14 December 2015. Retrieved 10 October 2017. ^ "EMPIRE CINEMAS Listings for Walthamstow". Empirecinemas.co.uk. Retrieved 1 August 2015. ^ "Walthamstow Cricket Club : home". Walthamstowcc.hitscricket.com. 3 June 2015. Retrieved 1 August 2015. ^ "Comment: editorials, opinion and columns". Telegraph. Retrieved 1 August 2015. ^ Sushila., Anand, (2009). Daisy : the life and loves of the Countess of Warwick (Paperback ed.). London [England]: Piatkus Books. ISBN 9780749909772. OCLC 276816379. Walthamstow Memories - Recollections of past and present Walthamstow residents. Wikimedia Commons has media related to Walthamstow.